Vox Scotland | Scotland’s national voice on mental health. VOX is Scotland’s national voice on mental health. We represent your views to Scotland’s politicians and health professionals to ensure our laws and mental health services reflect your needs and interests. If you have a lived experience of mental illness, join VOX to start shaping the mental health agenda. VOX is run by people with mental health issues for people with mental health issues. We are the ‘voice of experience’ and make sure our members’ views are heard – loud and clear!! 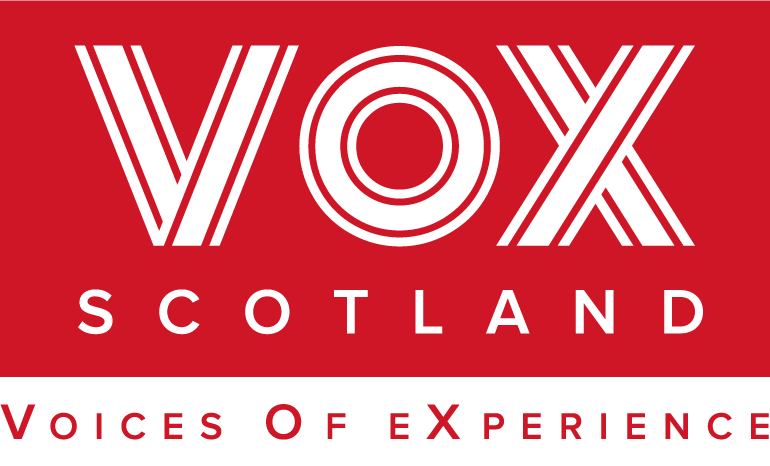 VOX is a member-led organisation. We focus on the issues that matter to our members. We helped to shape the 2015 Mental Health Act and represented our members’ views on the subject of smoking in hospital grounds. We undertake research and provide training to make sure our members’ views are heard loud and clear! We are open and transparent and share our work with a national audience. Join VOX to start shaping our priorities today. The 2003 Mental Health Act is Scotland’s most important piece of legislation. It states when you can receive treatment against your will and created safeguards to protect your rights. It established the Mental Health Tribunal and introduced Advance Statements and Named Persons. The Act was updated in 2015 and VOX helped to shape this new Act. If you fully understand these Acts, you’ll be better placed to protect your rights, access good treatment and make your voice heard. Mental illness is extremely inclusive and can affect anyone. Young or old, male or female, black or white, rich or poor, gay, straight or transgender. VOX is also extremely inclusive. Anyone in Scotland aged 16+ with a lived experience of mental illness – past or present – can join and membership is completely free! Our full-time Diversity Coordinator reaches out to every community across Scotland. Your experience, your insight and your membership will strengthen us – join VOX today!